Former Greek Finance Minister: Massive IMF Bailouts are “Ponzi Austerity” Scheme | Democracy Now! As the White House is backing calls for Greece to continue to implement widespread austerity measures, we spend the hour with former Greek Finance Minister Yanis Varoufakis. Earlier this week, negotiations between Greece and international creditors hit an impasse over the bankers’ demands for extra austerity measures. The International Monetary Fund is demanding cutting Greek pensions and eliminating income-tax exemptions if Greece does not hit its budget targets. “Cutting down pension is not reform. It’s like confusing butchery for surgery,” says Varoufakis. He served as the Syriza party’s first finance minister after the left-wing party took power in 2015, after promoting an anti-austerity platform. He is in the United States promoting his new book, “And the Weak Suffer What They Must? : Europe’s Crisis and America’s Economic Future.” Earlier this year, he launched a new pan-European umbrella organization called Democracy in Europe Movement 2025, or DiEM25. AMY GOODMAN: Yanis Varoufakis joins us today as the White House is backing calls for Greece to continue to implement widespread austerity measures, following President Obama’s meeting with German Chancellor Angela Merkel earlier this week. Greece and its international creditors are once again negotiating the terms of the bailout and the extent of the austerity measures creditors can impose. On Wednesday, White House spokesperson Josh Earnest told reporters the administration believes Greece must follow through on structural reforms. REPORTER: Is there any concern within the White House about what appears to be an obvious deadlock between the creditors over the Greek debt situation and the International Monetary Fund? PRESS SECRETARY JOSH EARNEST: I don’t have any detailed knowledge of those ongoing discussions. Obviously, you know, we’re very supportive of the efforts that members of the EU have made to deal with the financial challenges posed by Greece’s finances. Part of that agreement included Greece following through on a number of structural reforms. And we certainly believe that—that Greece has a responsibility to do that. NERMEEN SHAIKH: Earlier this week, negotiations between Greece and international creditors hit an impasse over the bankers’ demands for extra austerity measures. The International Monetary Fund is demanding cutting Greek pensions and eliminating income tax exemptions if Greece does not hit its budget targets. It’s the latest impasse in years of fierce political clashes between Greece and international creditors. For more, we’re joined by a man who had a front-row seat to these battles: former Greek Finance Minister Yanis Varoufakis. He has been called “the most interesting man in the world.” He’s also a professor of economic theory at the University of Athens and the author of more than 15 books, including, most recently, And the Weak Suffer What They Must? : Europe’s Crisis and America’s Economic Future. AMY GOODMAN: Yanis Varoufakis’s book takes a sweeping look at the history of the eurozone, the creation of the euro, the construction of the European Central Bank, the lead-up to the 2008 crisis, and what went so disastrously wrong in its wake. He served as the Greek finance minister from January 2015 to the following July as a member of the anti-austerity Syriza party, during which he helped lead Greece’s battle against European central bankers and an historic referendum in which Greeks resoundingly voted down austerity. But only days after the “no” vote, Varoufakis resigned. At the time, he said, quote, “I shall wear the creditors’ loathing with pride.” Earlier this year, he launched a new pan-European umbrella organization called Democracy in Europe Movement 2025, or DiEM25. 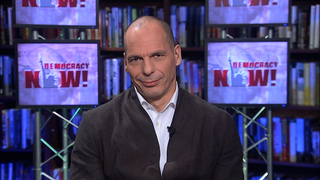 Yanis Varoufakis, welcome back to Democracy Now! It’s great to have you with us. Can you respond to what’s happened right now with Washington and Germany, President Obama’s meeting with the German chancellor, Angela Merkel, calling for continued austerity in Greece? What exactly does this mean? YANIS VAROUFAKIS: Well, it means that we have a stupendous case of the White House spokesman violating the Obama line. When we were elected in January of 2015, President Obama came out with a splendid statement. If I recall correctly, he said something along the lines that the principle of the greatest austerity for the most depressed of nations needs to be re-examined. He was opposing it. And now we have, yet again, this typical disconnect in the American administration. It’s quite astonishing and saddening. On the one hand, the president is making all the right noises, and on the other hand, his spokesman comes out and supports cruel, self-defeating, irrational, inefficient, mind-blowingly inane austerity. And, Amy, allow me to correct the conventional wisdom peddled by the mainstream media. If you read or listen to all the reports regarding the negotiations and [inaudible] between Greece and its creditors, you will hear what we heard just before in your report, that the Greek government’s negotiations have stalled, because supposedly Greece, the Greek government, Athens, is resisting structural reforms. But nothing could be further from the truth. The fact of the matter is that the Greek government last summer, in July of 2015, surrendered to the creditors. This is why I’m no longer the finance minister. And ever since, it governs by email. It’s simply told—it is simply told what to do. And it’s trying to do it. It is trying to implement it. The problem at the moment, the reason why we have yet another impasse, yet another delay in the announcement of the great reforms and fiscal policies that will be applied to the case of a depressed Greece, is very simple. The International Monetary Fund and the German government are loggerheads. They are at each other’s throats. They can’t see eye to eye. The elephants in the room are tussling, and the little pipsqueak mouse, Greece, is being trampled upon. This is the truth. It’s got nothing to do with the Greek government stalling on structural reforms. By the way, there are no structural reforms in question. Cutting down pensions is not reform. It’s like confusing butchery for surgery. It’s not the same thing. NERMEEN SHAIKH: Well, earlier this month—I want to ask about the details of a discussion that WikiLeaks released, precisely of IMF officials in charge of managing the Greek debt crisis. Poul Thomsen, the head of the IMF’s European Department, and Delia Velculescu, the IMF mission chief for Greece. Could you talk about what was revealed in those discussions and what the significance is? YANIS VAROUFAKIS: Well, exactly what I just said. If you read the dialogue, it’s very clear. The IMF people are utterly frustrated with Germany. Why? Because the IMF, whatever one may accuse them of—and there is a lot to say about the IMF—at least they are numerate: They can add, subtract; they know arithmetic. And they know that the Greek debt is unsustainable. They know that the numbers that the European Commission, on behalf of Germany, is imposing upon Greece are numbers that will explode, they will fail. In six months’ time, we’ll have another failure of the program, like we’ve had in the last six years. So the IMF wants to—the IMF, wherever it goes, it tries to impose what they refer to as internal devaluation—devaluing labor, devaluing pensions, closing down small firms, small shops, pharmacies, and replace them with supermarkets. That creates—you know, liquidate, liquidate, liquidate. So, that means, of course, a wholesome shrinkage in the economy, in the social economy. Now, that is their want. But at the same time, they are clever enough to know that when you shrink the national income and the social economy of a country like Greece, a program country, then you can’t expect them to repay the gargantuan debt that has been accumulated. So, they’re like a quasi-numerate villain, who wants to turn Greece into a desert, call it peace, and, of course, they understand that they have to call the debt. The German government, on the other hand, and the European Commission that is acting on their behalf, simply do not want to talk about the debt, because this would mean going to the federal Parliament in Berlin and admitting that the loans for Greece, the so-called bailout loans for Greece, were not loans for Greece. They were loans, bailout loans, for German and French banks. And that money was never intended to come back to the German, to the Slavik, to the Portuguese taxpayers. It was always going to be money that was given from the taxpayers of Europe—initially from Greeks, and then everybody else—to the French and the German bankers. So they refuse the IMF’s calls for debt relief. And now the IMF, Washington, D.C., and Berlin are clashing, and they can’t agree. If you read this dialogue, it’s spectacular. At some point, they say, “What will it take to get the Europeans”—he means Berlin—”to see that it’s about time to cut the debt?” And Poul Thomsen’s response is, “We need an event.” By that, he meant another crisis, another bankruptcy, another spate of bank closures in Greece, to concentrate the mind of Mrs. Merkel, who is named explicitly. So, this story, this illusion, this soothing myth—soothing for the media—that the Greek government is resisting reforms, and this is why we have an impasse, has been completely and utterly exploded by the WikiLeaks exposure of these dialogues. AMY GOODMAN: What is Ponzi austerity, Yanis Varoufakis. YANIS VAROUFAKIS: Well, Amy, we all know what Ponzi growth is—right?—what a Ponzi scheme is. It’s when you pretend to be growing your income on the basis of unsustainable debt. And the more debt you take, the more you pretend that you’re growing. But then you have to have even more unsustainable debt in order to maintain this illusion. Now, what is Ponzi austerity? Once these bubbles burst, the only way you can continue to pretend that you’re solvent is through even more debt, that will be utilized in order to repay or to pretend to repay the previous debts. And if you’re going through a period of belt tightening to impress creditors that you’re doing the right—the good Protestant thing, which is, you know, to be parsimonious and to tighten your belt, you have austerity, which continuously reduces national income, because when you reduce pensions, when you reduce investment, when you reduce all the determinants of aggregate demand, income of the nation shrinks. And you keep tightening that belt through more pension cuts, more reductions in public health and so on, and public education, and you keep on taking new unsustainable loans in order to pretend that you’re not insolvent. That’s Ponzi austerity for you. AMY GOODMAN: Yanis Varoufakis, we’re going to continue this conversation after break. Professor Varoufakis is the former finance minister of Greece, now teaching economic theory at the University of Athens. His new book is titled And the Weak Suffer What They Must? : Europe’s Crisis and America’s Economic Future. We’ll be back with him in a minute.